(Release Date: November 11, 2014)  "Dolls" is an R-rated Grimms' fairy tale, and a surprisingly sweet one at that. Well, as sweet as can be expected for a film about toys killing people, who in turn are shrunk into corpsy, doll-sized versions of themselves. Coming off the Grand Guignol double dose that was 1984's "Re-Animator" and 1986's "From Beyond," director Stuart Gordon changed his pace and broadened the boundaries of what viewers thought he was capable. Dolls is still firmly rooted in horror, but it takes an innocent child's-eye view of a society that has grown up too fast and forgotten too quickly what it is like to believe anything is possible. 6-year-old Judy Bower (the adorable Carrie Lorraine) is a daydreamer at heart, and her temperamental dad, David (Ian Patrick Williams), and wicked stepmother, Rosemary (Carolyn Purdy-Gordon, gnashing her teeth), have no patience for it. While on a road trip, their car gets stuck in the mud and Rosemary cruelly tosses Judy's beloved teddy bear in the bushes. Sad about losing her stuffed animal, Judy cannot help but imagine it growing to human scale and mauling her family to death. With a storm quickly approaching, the three of them seek shelter in a nearby mansion owned by welcoming elderly couple Gabriel (Guy Rolfe) and Hilary Hartwicke (Hilary Mason), the former a dollmaker by trade. Soon, three more unexpected guests arrivenice-guy Ralph Morris (Stephen Lee) and the two hitchhikers he picked up, British rocker chicks Isabel (a very funny Bunty Bailey) and Enid (Cassie Stuart). They're all graciously invited to spend the night"the longest night in the world," Gabriel tells Judybut as the witching hour approaches and Isabel and Enid scam to steal antiques from the house while everyone sleeps, it becomes clear that the porcelain dolls adorning the shelves and mantles in every room aren't as lifeless as they may seem. Dolls is whimsical and devilish in equal measures, a spin on the classic haunted house tale and a fable about an underappreciated little girl who finally gets a shot at happiness. Judy's father clearly prefers his snooty, rich wife to his daughter, and Rosemary revels in it. They can't wait for Judy to be out of their lives and back with her real mother in Boston. Judy, meanwhile, keeps a brave face, allowing her gift for imagination to take her away whenever she's feeling low. It is not the inner musings of a child, though, when Judy witnesses Isabel, her face bloodied, being dragged down the hallway by "little people." With her parents no help, she seeks out Ralph, the one grown-up out of all the guests who hasn't lost touch with his childhood and might possibly be able to buy into what she's just seen. The dolls, in fact, are alive, and, as cute and unassuming as they can be, they don't take kindly to being mistreated or disrespected. As the no-good adult population dwindles, each one of them getting what's coming to them, fast friends Judy and Ralph try to keep their calm as they investigate Gabriel's basement toy shop. Impressive special effects (for 1987) bring the dolls to believable, often malicious life, with Gordon nicely blending stop-motion with animatronics. Violence comes in frequent bursts, and the murder setpieces are inventive without being too graphic or nasty. A sequence involving toy soldiers who blow their horns and sound the drums before popping Enid full of lead is a highlight, as is a vicious, much-deserved attack on Rosemary from all sides. When David returns to bed, cuddling up next to his now-dead spouse as the blood from her wounds leaks through the bedsheet and just out of his eyesight, it is a delightfully twisted moment. The transformation of one of the characters into a Punch doll is also beautifully perverse. "Dolls" is as warm and sincere as it is dastardly and spooky. Laced in crimson, its messagesabout one's fleeting innocence, about never losing one's sense of wonder, about always keeping the good memories of one's childhood aliveremain well-meaning and pure of heart. "Dolls" makes its high-def premiere with a 1080p transfer that is as good as this film has ever looked. A top-to-bottom restoration could have assisted in cleaning up the picture's fairly consistent, albeit minor, specks of dirt, but fortunately there are no more prominent or egregious instances of damage. What is hugely improved is the image's uptick in grain resolve and clarity. Facial features and background details that have never been glimpsed before are on view, while the atmospheric beauty of the art direction and cinematography come alive. The color scheme is especially gorgeous, reminding in some scenes of the deep, bold hues of Dario Argento's "Suspiria." The 5.1 DTS-HD Master Audio is front-heavy and a handful of moments of dialogue and sound have a hollow core. These are few and far between, however. With expectations tempered, this is an effective sound mix. A 2.0 audio track is also graciously included. 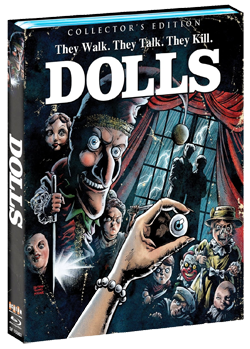 Scream Factory's Collector's Edition Blu-ray release of "Dolls" does not disappoint. This was a childhood favorite of mine, and so it was a true thrill to see it treated so well. Arriving with all of the holdover special features from the old MGM DVD and a brand-new documentary featuring cast and crew reminiscing on the film (it was great to also see an "In Memory" card for actor Stephen Lee, who passed away earlier in 2014), this is a fairly definitive release and one that fans will need in their collection. Highly recommended.